You are currently browsing the tag archive for the ‘master’ tag. 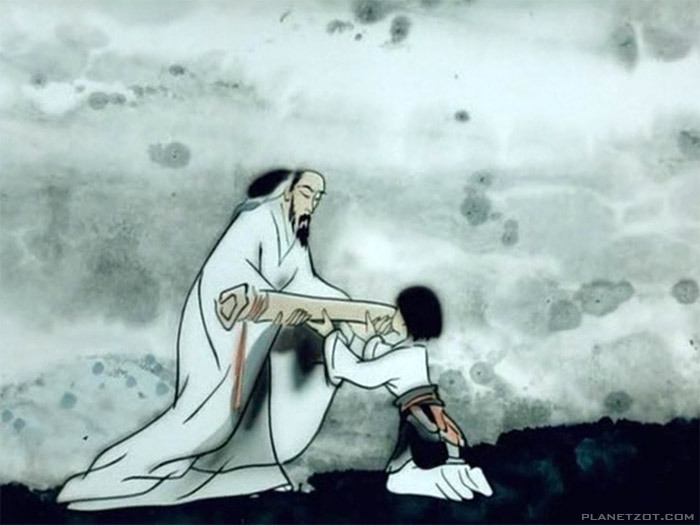 After a hiatus of 25 years, China’s pioneering star animator Te Wei returns with this powerful and serene film, which is probably the most Chinese film ever made. ‘Feeling from Mountain and Water’* tells about an old master passing of the Guqin, a Chinese zither, and most revered of all Chinese classical instruments. Feeling his time has come, the old master passes his art on to a musical boyish fisherman. In the end we watch the boy playing an ode to his master and to nature on the guqin, which is now his. The designs of this short are extremely beautiful, the watercolor backgrounds are on the verge of the abstract, and the animation is delicate and sophisticated. The film knows no dialogue, and much of the story is more suggested than shown. Te Wei must have felt close to the film’s subject, as he himself was already in his seventies when he made this. Meanwhile, a younger gang of Chinese animators had taken inspiration from his films from the 1960s in what must have been a Chinese animation renaissance since the devastation of the cultural revolution. ‘Feeling from Mountain and Water’ is a very beautiful and meditative film on nature, music and life, and to me the masterpiece of Chinese animation.